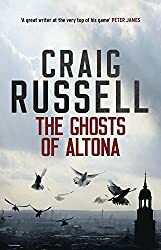 The Ghosts of Altona by Craig Russell – see yesterday’s post for the opening paragraphs and blurb. And Mrs Jordan’s Profession: the Story of a Great Actress and a King by Claire Tomalin. Acclaimed as the greatest comic actress of her day, Dora Jordan lived a quite different role off-stage as lover to Prince William, third son of George III. Unmarried, the pair lived in a villa on the Thames and had ten children together until William, under pressure from royal advisers, abandoned her. The story of how Dora moved between the worlds of the eighteenth-century theatre and happy domesticity, of her fights for her family and her career makes a classic story of royal perfidy and female courage. See this post for my thoughts on the book. 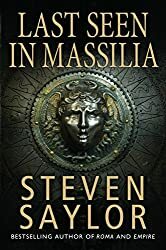 Next: This is always difficult for me to predict – last week for example I listed some books I thought I might be reading next but after starting each of them I put them all down for a while and began reading The Ghosts of Altona – which wasn’t on the list. 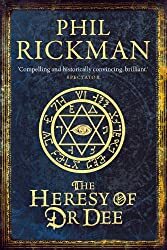 At the moment I’m thinking that the next book I read could be The Heresy of Dr Dee by Phil Rickman, which I’ve been meaning to read ever since I read his first Dr Dee book, The Bones of Avalon. I thought of this book because ITV are broadcasting a new series adapted from Rickman’s Merrily Watkins books, beginning tonight with Midwinter of the Spirit, about a priest (Merrily) who is also an exorcist. I have the first four books on Kindle waiting to be read and was tempted to try to read the first one before watching the programme, but as I expect the adaptation could easily be different from the books I decided not to as I don’t want to get irritated and keep saying ‘it’s not like that in the book’ whilst watching the programme. Have you read any of these books and what have you been reading? I’ve been meaning to read Phil Rickman’s series about Merrily for a really long time. Nice to know a TV adaptation is starting. Hope we get it here eventually. This would be a good time of year to start with the first book. Mrs. Jordan’s profession sounds fascinating. Hope you enjoy it. Happy reading and thanks for participating in WWW Wednesday! I’ve recorded Merrily Watkins too and will watch it later. I did enjoy Bones of Avalon – gave it 4 stars on Goodreads, rounding it up from a 3.5. I’m really enjoying Mrs Jordan, Claire Tomalin’s writing is bringing Dora to life, using extracts from contemporary letters helps enormously. I didn’t know about the PM’s ancestry but a quick look on Wikipedia tells me that Dora and William IV are among his ancestors. 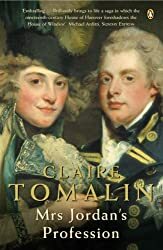 I’ve not read any of your books this week but very much like the sound of Mrs Jordan’s Profession: The Story of a Great Actress and a Future King, so much so it’s been added to my wishlist! I haven’t read any of these, but Mrs Jordan’s Profession: the Story of a Great Actress and a King by Claire Tomalin sounds really interesting. I have just finished reading The Raven’s Head by Karen Maitland, and I am looking forward to continuing my mysterious reading with Airs Above the Ground by Mary Stewart.